What to bring, what to take, what to pack? If you’re headed out for your first camping trip or two, before you’ve had any car camping experience, how are you supposed to know what might be necessary, useful, or nice? Here’s a list for first-time car campers to tide you over until you have a few trips under your belt. By then, you’ll be able to come up with your own must-haves. Resist the urge to buy equipment at the beginning. Borrow or rent. Improvise. Then decide. It’ll cost less in the long run, and you won’t regret your purchase. As a first-time car camper, Muddy Boots and another newbie (aka Happy Sally) drove off in a high-mileage Chevette loaded with a borrowed tent, as well as a whole mess of other stuff not exactly designed for camping. In the absence of a sleeping bag and even a rudimentary outdoor sleeping pad, Muddy Boots simply rolled up a 3″ foam mattress, sheets, blankets, and pillows and jammed the whole “bed roll” into the back seat, floor to ceiling. Punchfest with Happy Sally narrowly avoided…. 10 days later, Muddy Boots knew a whole lot more about car camping (Happy Sally, too), what was needed, what might work, what would be wonderful to have. First purchase? An REI membership. No joke. With added input from old-timers (RIP) in a mountaineering club, Muddy Boots began accumulating quality equipment one piece or so per year. Take that back: there were a FEW poor choices. The rock hard skinny mattress? Oh, boy. Moral? Learn first, buy later. A headlamp, which you’ll use for a whole lot of things besides camping, including picking up dog poop, reading on the plane, keeping in your glove compartment for emergencies. Yes, you’ll look like a dentist, but you’ll soon figure out why headlamps were invented. Yes, if you don’t have one, buy a Petzl, Black Diamond, or Princeton Tec (some store brands are manufactured by these 3 too). Check the packaging to make sure the headlamp has a long burn time (60+ hours) and take an extra set of batteries. Your NP Senior Pass if it’s a federal campground, any type of federal campground. Checkbook or cash to pay for your camp spot. A credit card is unlikely to be useful. Bunch of quarters in case you’re lucky enough to get a shower. Novel, sudokus, bird ID book, playing cards, the Wall Street Journal. Whatever you’d love to do if only you had a leisurely moment. If your car is big enough and has enough flat space, sleep in it. Otherwise borrow or rent a tent. If you’re sleeping in your car and you’ll be in a buggy location, rig up a bug net! Don’t bother with a sleeping bag if you don’t have one. Take whatever bedding you have. Cooler, natch, for coldish items. Closeable bins (e.g. Sterilite or Rubbermaid) for food and dry goods. All the food you need. Don’t fret too much about what you’re going to eat, though. E.g. If you don’t have a stove, take sandwiches, hot dogs, breakfast cereal, salads, instant chocolate pudding, Jello no-cook cheesecake, Jiffy Pop…. Roll of paper towels for whatever. Toasting fork if you’re going to cook anything over a fire (nature in the campsite, including twigs, belongs to critters). Get a cheap toasting fork made by Coghlan’s or Coleman. Set of silverware: use old ones or buy at the thrift store (current going rate: 10 cents a piece). Length of paracord, clothes line, rope, string for hanging out damp stuff. For a campfire, take a lighter and a fake fire log. Do NOT take firewood: you buy it onsite. Scrounge a lantern, if you can, but don’t forget wood matches if it has a flame (a lighter might not fit under the globe). Some people like camp chairs. You can always just sit at the picnic table if you don’t have a chair. Old bathmat so you can sit on the picnic bench in dry and cushioned comfort. When sitting around, you get colder faster. Take warmer clothes than you anticipate, including a light hat, long pants, a sweater, and some kind of jacket. Sleep in baselayers, sweats, PJ’s, shorts, your clothes, or nothing. Washkit etc. Include soap, toothbrush, hand sanitizer, toothpaste…. Supplies like sunscreen, swimsuit, and bug repellent, if needed. Write a comment below if you have other budget-minded suggestions for a first-time car camper. Photo credits. Featured image, Marshmallow, Nicely browned: CC BY 2.0 by J Wynia via Flickr. Top…Lewis Lake Campground Yellowstone: Public Domain NPS/Neal Herbert. Top panel…Camping en Lavra (Portugal): CC BY-SA 2.0 by Mario Sánchez Prada via Flickr. 1978 Chevette: CC BY-SA 2.0 by RL GNZLZ via Flickr. Headlamp panel… Headlamps at dinner time and Aurora Borealis: CC BY-ND 2.0 by Jacob W. Frank for Four Corners School of Outdoor Education via Flickr. Princeton Tec: CC BY-ND 2.0 by Jenna Whetzel for Four Corners School of Outdoor Education via Flickr. Card and cash panel….National Park Senior Pass. Laundering dollar bills: CC BY 2.0 by Images Money via Flickr. 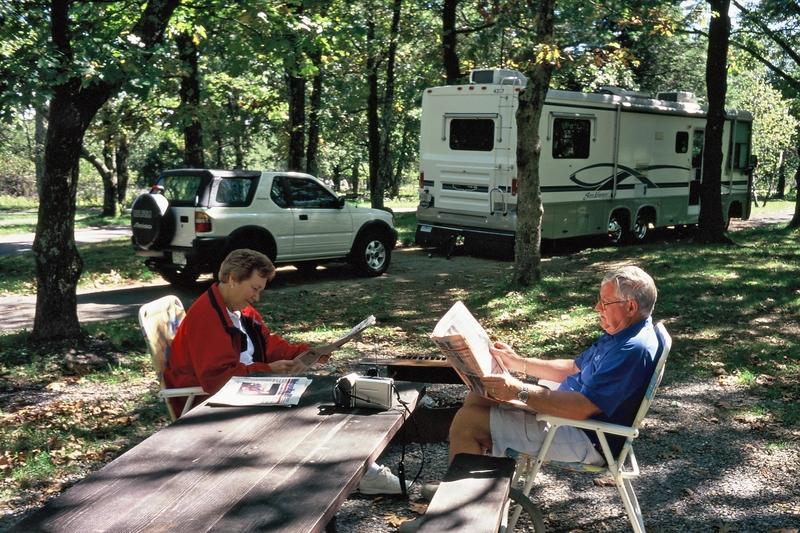 Couple reading at Big Meadows Campground, Shenandoah National Park: Public Domain by National Park Service. Store stuff in bins panel…Grand Canyon National Park, Mather Campground: CC BY 2.0 by Grand Canyon National Park via Flickr. Adirondacks, photo subject to copyright P. Wanzer. Fire cooking panel… Marshmallow, Nicely browned: CC BY 2.0 by J Wynia via Flickr. Hotdogs, Lunch! : CC BY 2.0 by Tara Schmidt via Flickr. Jiffy Pop: CC BY 2.0 by Jessie Pearl via Flickr. Left or above, Crested Butte Lucy Clark 7-2014DSCF3072: CC BY 2.0 by Lucy Clark via Flickr.